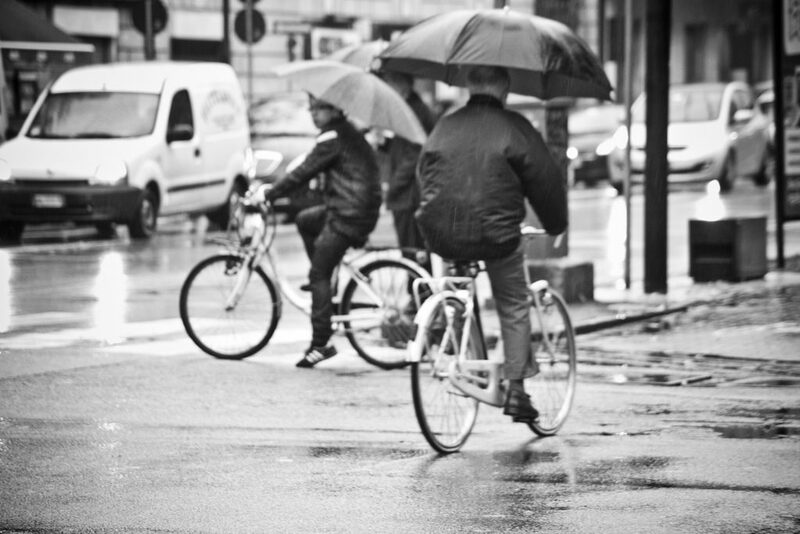 Scisnack | Do Bergen cyclists care about rain? When I ask my friends in Bergen why they don’t ride their bikes more often, they typically respond “because it’s always raining here”. Their response sounds reasonable in a city with an average of 231 rainy days a year. But do more people really cycle when it’s dry? I decided to take a closer look at Bergen’s cycling and weather statistics. Illustration photo taken from Mikael Colville-Andersen. As expected, the cycling activity in our city is highest during the warm and light months (Figure 1, compare red bars with green graph). The exception is July, which is the time for summer holiday. But if you pay attention to the amount of precipitation (blue bars), you’ll notice that September is twice as wet as the driest month, May. Even so, almost the same number of people cycle in September as in May. Figure 1: Bike passages per day for 2009-2017 (red) and 2017 only (grey), averaged over 4 of the most popular bike passage stations in Bergen (Fjøsangerveien, Kråkenes, Åsaneveien and Fløenstien). Also shown is the 2009-2017 average of temperature (green) and precipitation (blue) at Florida, Bergen. Data are taken from Statens Vegvesen and Norwegian Meteorological Institute. One contribution to the high bike activity in September comes from 2017 (thin, grey bars). Two reasons for this outstanding peak can be the exceptionally good weather and, maybe more importantly, the 2017 world championship for bicycle road racing held in Bergen. Many roads were closed for cars, and people were forced to use their feet or their bikes. Maybe people were also inspired by world class athletes cruising through their neighborhoods. Although such events can have a longterm influence on people’s biking habits, what happened in 2017 is not enough to explain why Bergen cyclists aren’t deterred by wet September. Another potential reason for why September is slightly more popular than May is the amount of public holidays. We expect less cyclists on the roads on days like Labour Day, Norwegian Constitution Day, Ascension Day and Pentecost. May is not only a period when we leave the city more often – it can also be a time where we fall out of our daily routines. Maybe that’s it; maybe it’s all about habits. It’s tough to start cycling in April and May after a cold, dark and slippery winter, especially when there is a public holiday every other week. In September, on the other hand, people are perhaps not yet ready to store their bikes away after a warm and light summer. 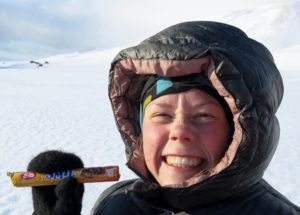 I am a PhD student in meteorology at the Geophysical Institute at the University of Bergen. My research focuses on weather dynamics in the midlatitudes, including air-sea interactions and storm development. Tagged Bergen, cycling, habits, Rain, Weather.